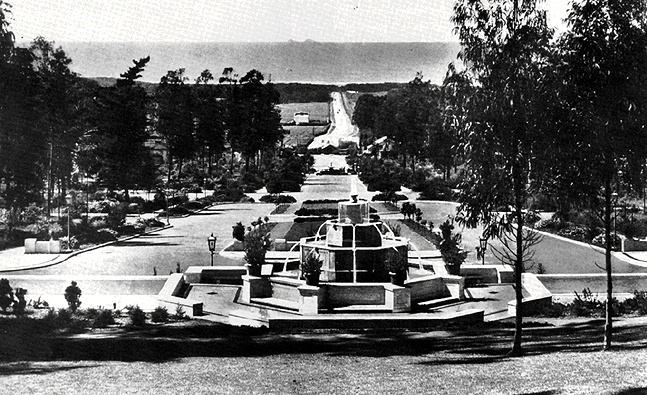 Fountain in St. Francis Wood early 1920s. A sunny afternoon stroll through the jasmine-scented streets and fountain-graced plazas, of St. Francis Wood is one of the special urban delights of San Francisco. Seeing the pastel hues of the Period Revival homes, the huge cypress and eucalyptus trees all around, and the wide, blue waters of the Pacific Ocean below conjures up images of an Italian hilltown. For those fortunate enough to live in St. Francis Wood, there are the added pleasures of regulation tennis courts for residents' use, an enclosed playground for neighborhood children, and a well-organized homeowners' association which meticulously maintains the landscaped parkways and commons. To design and build an ideal community with complete aesthetic harmony has been the dream of every great architect and city planner. In the United States, this desire crystallized into a concept known as the "City Beautiful" movement at the turn of the century. First displayed in the design of the Beaux-Arts buildings and classically-ordered fairgrounds of the World's Columbian Exposition in Chicago in 1893, this movement was brought to San Francisco after the 1906 earthquake by Chicago architect Daniel Burnham. The monumental Civic Center complex, with its centerpiece of City Hall and the broad plaza and fountain in front of it, was the first public manifestation of the City Beautiful movement in the Bay Area. But it was in the private development of the community of St. Francis Wood, at the eastern edge of San Francisco's Sunset District, that the City Beautiful concept was first successfully applied to residential planning. In the early years of this century, the area of San Francisco west of Twin Peaks remained Largely undeveloped, awaiting an engineering breakthrough to allow easy access from the heavily populated sections to the north. That breakthrough came with the construction of the Twin Peaks trolley car tunnel. The planning for this tunnel began several years before its completion in 1917, and developers could foresee the potential it presented for residential subdivisions. Mason-McDuffie was the first real estate company to take advantage of this opportunity when it began planning a new residential park in 1912 along the western slope of Mt. Davidson. This new community was named St. Francis Wood, to emphasize the neighborhood's planned harmony with its natural setting. In order to insure that the street plan for St. Francis Wood would strike a perfect balance with the preservation of large areas of open parkland, Duncan McDuffie hired the nationally renowned landscape architecture firm of Olmsted Brothers from Brookline, Massachusetts. The patriarch of this illustrious family, Frederick Law Olmsted, Sr., had been the creative force behind the landscape design of such famous public sites as Central Park in New York and Yosemite National Park. The younger Olmsted Brothers were employed by Mason-McDuffie for several of their earlier developments, and now they put their energies into making St. Francis Wood one of the finest residential parks in the nation. 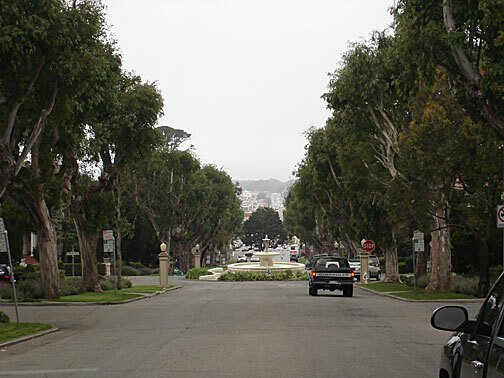 In accordance with Duncan's stipulations, all electric and telephone wires were placed underground, and St. Francis Park was created at the eastern end of St. Francis Boulevard. All the streets were laid out to conform to the tract's natural topography. These plans were carefully integrated with the work of supervising architect John Galen Howard, who designed the graceful Beaux-Arts style entrance portals at the mouth of St. Francis Boulevard and the monumental fountain and terraced plaza at its terminus. 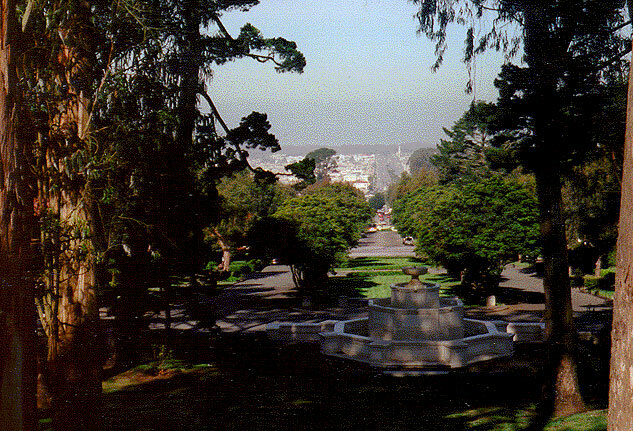 From the upper steps of this plaza, residents and visitors can still observe a sweeping vista down the broad tree-lined boulevard to the Farallones on the Pacific horizon. The outbreak of the first World War in 1914 occurred just as the first residential lots in St. Francis Wood were opened up for sale. For the next five years, the real estate market in San Francisco remained depressed, jeopardizing the survival of the entire project. In 1919, however, the market began to improve again, and construction in St. Francis Wood resumed at a healthy pace. Here, as in the Claremont Park development, firm restrictions on the type and quality of construction were strictly enforced. No "apartment houses, groceries, laundries, saloons, stables, or undertaking establishments" were allowed, and any balconies or overhanging extensions which blocked a neighbor's view or sunlight were prohibited. Each home had to sit at least fifteen feet back from the sidewalk, and a minimum construction cost of $6,000 was mandated to guarantee a high caliber of house design. After Howard stepped down as supervising architect, Henry Gutterson, a student and protege of Bernard Maybeck, succeeded him. Gutterson designed many of the finest homes in St. Francis Wood during his twenty-year tenure, as well as the circle fountain near the main entrance. By 1925, 500 families lived in St. Francis Wood, and it was being used as a model for residential parks as far away as Kansas City, where developer J.J. Nichols incorporated many of Mason-McDuffie's ideas into his subdivisions. Its reputation was even known in Europe. Dr. Werner Hegemann, the top city planner in Germany, came to study St. Francis Wood and afterwards described it as "...the most distinguished residential suburb not alone in California, but in America." 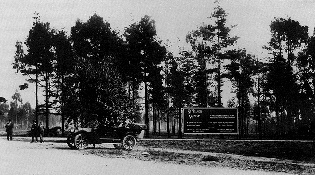 Entrance to St Francis Wood, early 1920s. Photo: originally published in The Argonaut, Volume 5, No. 2, Fall 1994, courtesy of Mason-McDuffie Real Estate Inc.